Building this live axle go kart can be fun for both you and your kids. Download the PDF plan bundle at KartFab.com and get exclusive access to the build support page. 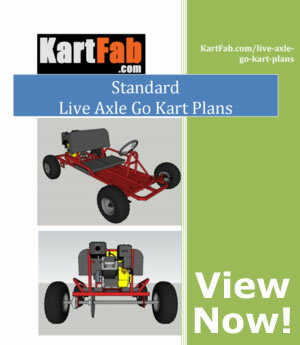 This standard live axle go kart kit provides you with the parts you need to build a go kart on a budget. The default tire, brake, and clutch options are sufficient for mostly level ground, and a 25 mph top speed. Optional performance upgrades will let you: stop faster (disc brakes), go faster (18" knobby tires)* and drive off road (30 series TAV2). Engine and frame Not Included! Kit does not include framing material nor mounting hardware. they arrive, expected in 1st week of May. *GoPowerSports recommends using the 30 series TAV2 if upgrading to 18" tires to avoid premature clutch wear. These Parts come in the kit. 1 6734 Seat Adjusters 8"
I was happy with all the parts in the kit when they quickly arrived in a few days. Nothing was damaged and everything was packaged well. Everything went together well by following the Kart fab plans. I recommend this and my son loves his new Kart! Does the free plans work for this kit?, y upgrade the wheels, brakes, etc. Or i have ti buy the deluxe plans? This kit has everything you need accept the steel & motor. The kit is definitely cheaper than buying the parts separately. Fast Shipping.